An excerpt from a short story, published in the latest issue of Stealing Time (a literary magazine for parents), themed Relations. To read the full story, purchase the issue here. As she hurried for her train, a blast of snow slapped her cheeks, reminding Aruna of when she had landed at Toronto’s Pearson International Airport for the first time. The frigidity had made her question her decision to come to Canada. It was too late, she had reminded herself. Now, snow and coffee — once alien to her– had become second nature to Aruna. And her good life had little to do with what her husband had imagined. She reflected on how time changes a person’s inner landscape in accordance with the outer one. The train sped past white houses, streets, trees. Aruna planted her cheek, covered with the woolen scarf she’d wrapped around her neck, to the window. The thickly snow-decked walls that vanished and re-appeared on the horizon were home. She rubbed her glove-clad hands and sipped coffee from the paper cup that danced slightly to the train’s motion on a tray table in front of her. Arriving in the province, she had felt confident of getting a job. Her many years as a lifestyle journalist in India couldn’t have been for nothing. So she consumed herself with the other variables—managing her son’s education, getting a health card made, securing a driver’s licence, and all the other minutia of moving to a new place. But she rented a damp basement apartment and managed the other details with ease. Only the job eluded her. The story very well opens the eyes of ‘outsiders’ in India etc., who look longingly towards the West as a utopia, to its sordid reality. The life of the immigrant, the brutal self reliance it has to fall back on in an unknown land, is nicely stated. In a way the story shows how non self reliant we are in India with all our relatives ready to absorb the shocks of our life and to make it more tolerable; in this sense, it is to the essentially relations-bound Indian mind to which the story speaks. Your story brings out both the struggle and the elation after a successful struggle very beautifully. At first, it is quite unbelievable why Aruna was putting up with Raghu. Couldn’t she just pack up and start life afresh? And then it dawned upon me that life wasn’t so easy. Breaking all ties isn’t easy at all. And this difficult life is what you have described so well in this story. …Just the feeling that Canada is so far away from home – and Raghu, in India – and is so, so cold makes this entire struggle so sublime and so worth it. Congrats to you for making some kind of a comparative study between the bleakness of Canada’s climate and the bleakness within Aruna to more beautifully sketch her struggle.Another good thing about the story is its length. You haven’t wasted words and sentences. 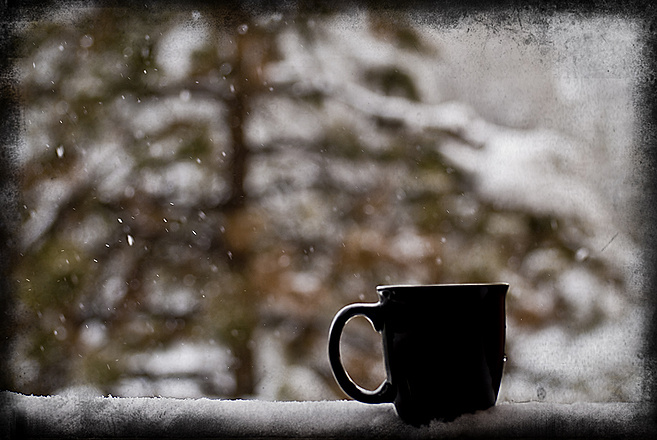 Bhaswati: I loved going through the excerpt of your short story “Snow and Coffee”. Like me you are good at observing things. Aruna’s train ride reminded me of mine during my childhood and teens. I always sat near the window during the entire trip from Calcutta to Karachi and watched things rushing by. I love Robert Louis Stevenson’s poem “From A Railway Carriage” for the same reason and have read it countless of times. You must be saying, “Mohsin is talking more about his childhood experiences than he is about my short story.” But then I should remind you that it was the magic of your story that did that. And mind you, not every writer can do that! Mohsin, your reminiscing always brings a smile on my lips, and it’s even better if my storytelling causes it. Thanks a lot for reading the excerpt. Bhaswati: You are most welcome where reading the excerpt is concerned. And I should be the one who should thank you for always keeping us entertained. 😉 Keep it up! That was a terrific peek. Thanks, Achyut! Please let me know if you want to read all of it. This is such a beautiful, beautiful word painting of the reality and the vulnerability of the protagonist’s life and how she strives to find meaning of the changed landscape and the way it impacts her psyche. needless to say I would love to read the entire piece ! Lopa, thank you so much for reading and commenting! Means a lot to me. Will share the full story with you some time.